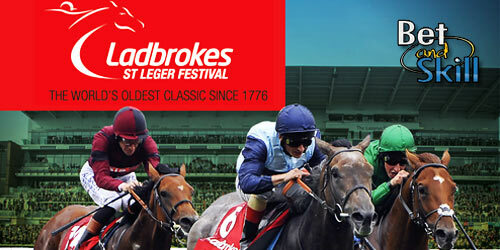 The pick of the English action comes at Doncaster in the form of the oldest Classic of them all, the historic St. Leger Stakes, sponsored by Ladbrokes.. This article contains our 2016 St. Leger Stakes betting preview including tips, predictions, enhanced odds, free bets and no deposit bonuses on the race! First run at Doncaster way back in 1776, this Group 1 contest run over 1m6f 132yards now offers close to £700,000 in total prize money. The race is named after a local sportsman, Anthony St Leger, who lived at Park Hill near Doncaster and had the idea of a race for three-year-olds, with colts carrying 8st and fillies 7st 12lb, over two miles. 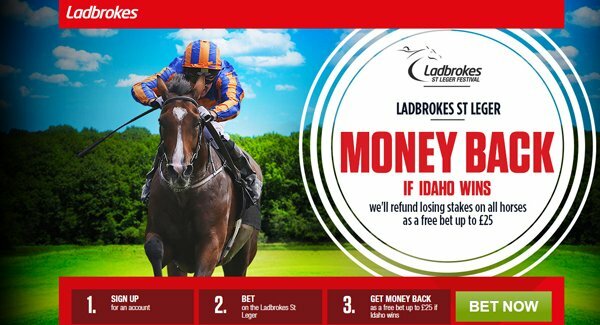 Idaho is the antepost favourite of this year's race as this colt has placed in both the English and Irish Derbies already this season. He secured the big-race victory his consistency deserved in last month's Great Voltigeur at York and now tackles a mile and three-quarters for the first time. Al Maktoum-owned colt Muntahaa is Idaho's strongest contender. The son of Dansil only landed his maiden at his third attempt but followed up that six length romp with a solid third in the King Edward VII Stakes at Royal Ascot, before winning at Listed level last time out at Chester. Housesofparliament landed Newmarket's Bahrain Trophy before beating all bar Idaho in the Great Voltigeur. In previous months, he he contested the Group 3 Gallinule Stakes last May, coming home 2 ¾ lengths fourth of 5 to Beacon Rock. He then contested the Group 2 King Edward VII Stakes at Royal Ascot, where he ran 2 ¼ lengths fourth of 9 to Across The Stars. Sword Fighter won the Queen's Vase at Royal Ascot and the Curragh Cup before finishing fifth in the Goodwood Cup in late July when he finished 3 ¾ lengths fifth of 14 behind Big Orange. Prior to that, he ran a sensational race to make every yard of the running and land the two-mile Listed Queen’s Vase at Royal Ascot in June. Just a few days later he continued his progression by landing the Group 2 Curragh Cup by 2 lengths from Landofhopeandglory. Ormito was second to Ventura Storm at Hamilton before filling the runner-up spot once more in the Geoffrey Freer at Newbury. Prior to that, in mid-June he headed to Royal Ascot for the Listed Queen’s Vase over two miles, running a disappointing 16 ½ lengths 11th of 18 behind Sword Fighter. Ventura Storm looked highly promising in landing three of his five starts as a juvenile but was a little slow to come to hand this term. His two more recent races however, have been much more promising. The son of Zoffany landed a soft ground Listed race at Hamilton and his effort in slamming a Group 3 field at Deauville last time out was even more impressive. Laura Mongan’s Harbour Law has done very little wrong in his career to date and looks overpriced at current odds. The son of Lawman ran Sword Fighter to within a length in the Queen’s Vase at Royal Ascot over 2 miles and followed up with a staying on fourth to Housesofparliament over 1m5f at Newmarket last time out. Mick Channon's Harrison was not far behind Housesofparliament in the Bahrain Trophy and was fourth in the Great Voltigeur. in early July he ran poorly in the Group 3 Gordon Stakes at Goodwood, coming home a tailed off last of 9 behind Ulysses. Pat Shanahan's 100-1 shot The Tartan Spartan completes the field but this horse looks to have no chance in this company. 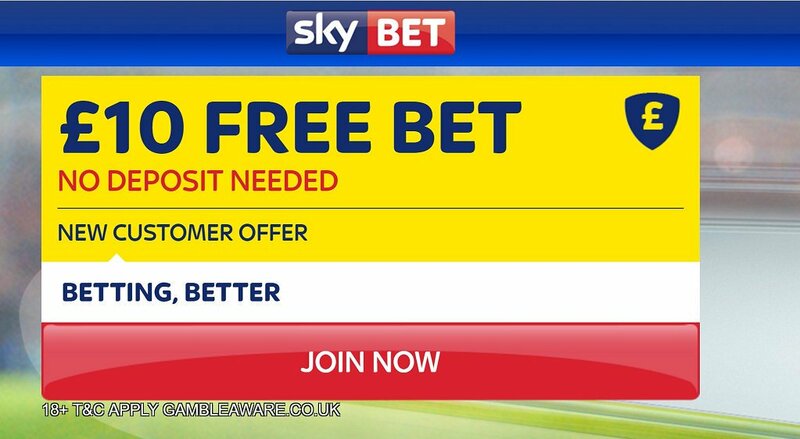 "Ladbrokes St.Leger Stakes predictions, betting tips, odds and free bets (Doncaster - 10th September 2016)"